Home > News > VegFund grantee Akashinga on CBS News! VegFund grantee Akashinga on CBS News! 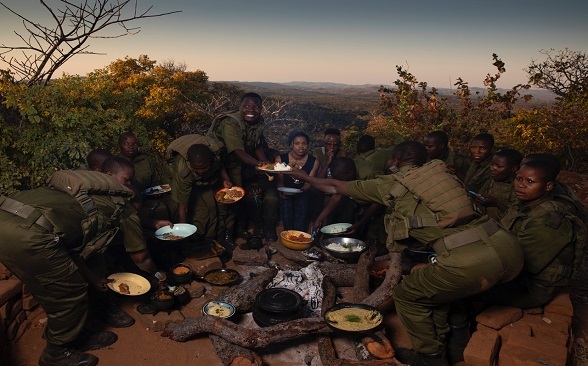 Akashinga (“the brave ones”), an all-female and vegan anti-poaching unit in Zimbabwe, Africa, were featured on CBS news last month. This International Anti-Poaching Foundation initiative is uniting conservation with compassion and tackling wildlife poaching head on. Damien Mander is an Australian former special operations sniper. He managed the Iraq Special Police Training Academy while deployed in Iraq. After spending three years on the front line, he traveled to Africa. There he encountered the horrors that African wildlife face. As a result, Damien founded the International Anti-Poaching Foundation and became an environmental activist and a vegan. If you’re interested in knowing more about his journey, watch his Modern Warrior TEDTalk. The goal of Akashinga is to end trophy hunting by recruiting 2,000 women to protect 30 million acres of African wilderness and biodiversity by the year 2030. It’s no secret that empowered women play a vital role in changing the world for the better. For the women of the Akashinga, this is an opportunity to become self-reliant and provide for their families while fighting against wildlife crime. Female fighters take on Zimbabwe’s illegal pouching. LIVE on CBS! This group protects one of the largest elephant populations in Africa. Elephant numbers in the region have declined by 40% since 2001 as a result of poaching. A full-time chef is employed at the camp to prepare vegan meals for the women. VegFund is pleased to be providing grant funding to assist with the costs of food for the program’s plant-based meals. In addition to CBS, several other international media outlets, such as The Guardian, BBC, ABC, and LIVEKINDLY, have covered the “Akashinga” initiative.